Thank you to everyone who attended the February 19, 2019 Open House and provided comments. Public involvement is very important to the Montana Department of Transportation (MDT). Given the regional and local importance of the Airport Road and Main Street intersection and feedback from the public received to date, the MDT team has decided to temporarily pause the project. During this time, the MDT team will re-evaluate the best path forward related to the intersection improvements. Please watch for project updates in late May regarding a new schedule, intersection evaluation process, and opportunities for further public involvement with the MDT team. MDT is currently working on the design of a project to be constructed in the area of Airport Road and Main Street in Billings. Construction is currently anticipated to begin in 2024. The Airport Road and Main Street intersection is located roughly two miles northeast of downtown Billings, just north of Rimrock Auto Arena at MetraPark. The intersection’s location is a critical junction for commuter, regional, and freight trips along the Airport Road and Main Street corridors. 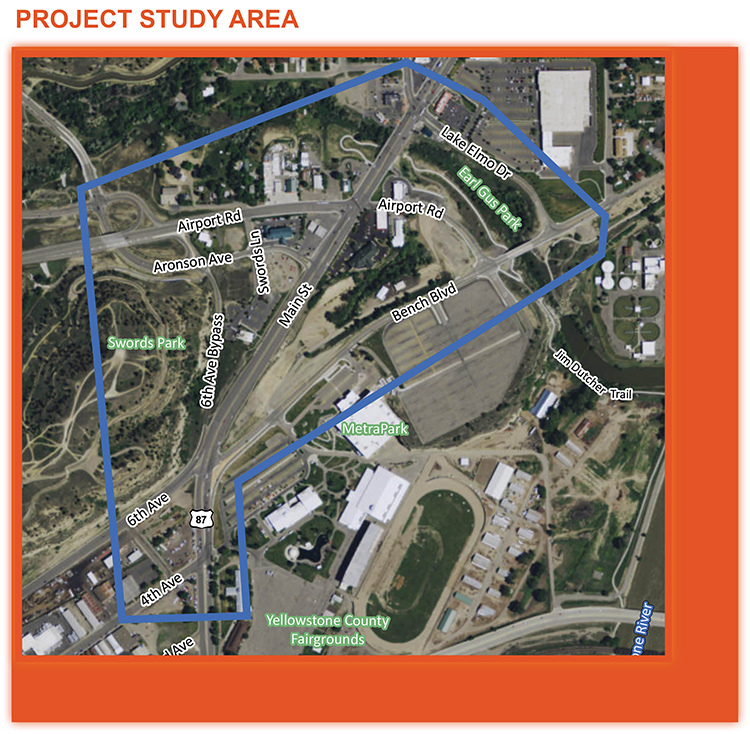 Designated as principal arterials, the two corridors connect recreation, residential neighborhoods, low density commercial, and light industrial land uses with downtown Billings and Interstate 90. The purpose of the project is to address the capacity and queuing issues, safety and mobility needs, signal upgrade needs, and other operational issues for all users within the project area. This project is part of a two phase plan that started in 2016. Phase 1 - Concept (2016): MDT conducted a transportation study that identified a proposed project for design and construction. The Signalized Southwest Quadrant alternative is being carried forward to the design phase based upon the analysis completed and public input received during Phase 1. Phase 2 - Design and Construction (2019-2024): Improvements include lane modifications, roadway widening, median work, minor realignments and upgrades to curb, gutter, Americans With Disabilities Act facilities, pavement, lighting, pavement markings, signing and signalized intersections.